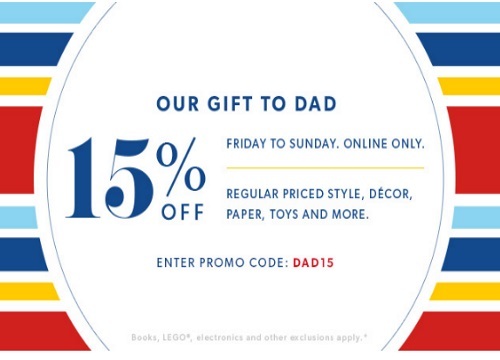 Chapters Indigo is offering 15% off this weekend just for Father's Day coming up! Save 15% off regularly priced style, decor, paper, toys and more with the promo code below. Enter the promo code DAD15 at checkout to get the offer. Promo is valid until Sunday June 19 2016. Not valid in-store or on kiosk orders. Offer excludes books, sale items, all electronics and accessories (including Apple and Kobo), LEGO products, American Girl products, Kate Spade New York products, Rosetta Stone products, Love of Reading Donations and gift cards.